After last year's accidental discovery of "zombie"-like bees infected with a fly parasite, SF State researchers are conducting an elaborate experiment to learn more about the plight of the honey bees. The scientists are tagging infected bees with tiny radio trackers, and monitoring the bees' movements in and out of a specially designed hive on top of the Hensill Hall biology building on campus. At the same time, they are monitoring hives on campus and on the roof of the San Francisco Chronicle's offices for further signs of the mysterious parasite and encouraging the public to participate through a new website ZomBeeWatch.org. After being parasitized by the Apocephalus borealis fly, the bees abandon their hives and congregate near outside lights, moving in increasingly erratic circles on the ground before dying. The phenomenon was first discovered on campus by SF Professor of Biology John Hafernik, and reported last year in the research journal PLoS ONE, with former SF State master's student Andrew Core as lead author. It's unclear yet how big of a threat the emerging fly parasite might be to the health of honey bee colonies, or if the parasite is linked to the colony collapse disorder that has devastated honey bee colonies in the United States, say Hafernik and colleagues. 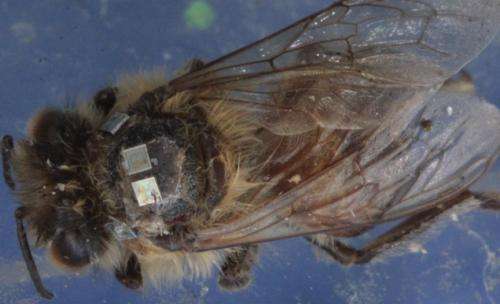 To learn more about how the parasitic fly affects the bees' behavior, the scientists have built a system to track the movements of infected bees in and out of a hive. Each bee has a set of tiny radio frequency trackers—each no bigger than a fleck of glitter—attached to the top of its thorax. The bees leave and return to the hive through a small tube outfitted with dual laser readers that interact with the individual trackers. The readers, which operate in a similar way to barcode scanners in a grocery checkout lane, create "virtually a 24-hour record of bees going in and out of the hive to forage," said Christopher Quock, an SF State master's biology student working on the hive's design together with bee keeper Robert MacKimmie. Knowing exactly when bees leave—and whether they come back—is important for understanding how and when the parasites might cause the bees to abandon their hives, Quock explained. The original study found bees disoriented and dying at night, for instance, but the researchers aren't sure whether the infected bees only leave their hives to fly in the dark. Quock's challenge has been to create a hive design where the bees "still have room to do their normal behavior." To get a unique identification and time stamp for each bee, he said, the insects have to pass one at a time under the laser readers through a narrow passage. Quock, who began work on the bees as an undergraduate, has also been perfecting a method for studying infected bees in the lab. "Hopefully in the long run, this information might help us understand how much of a health concern these flies are for the bees, and if they truly do impede their foraging behavior," he said. "We also want to know whether there are any weak links in the chain of interactions between these flies and honey bees that we could exploit to control the spread of this parasite." In addition to understanding how parasitism affects foraging behavior, Andrew Zink, SF State assistant professor of biology and Quock's advisor, said that the tracking project might eventually shed light on how the infected bees behave inside the hive. "We are also interested in knowing if parasitized foragers are the recipients of aggression by other workers, for example if they're expelled from the hive, or if parasitized foragers behave in ways that disrupt hive productivity." If enough of the parasitized bees do the wrong "waggle" dances to send unparasitized foragers off in the wrong directions for food, or distract unparasitized foragers through antagonistic interactions, the hive's productivity could falter. Combined with the premature deaths of the infected foragers, Zink said, these within-hive effects "would represent a two-fold cost of fly parasitism for the hive." The radio tracking study "could give us a hint" as to why parasitism alters bee behavior, Hafernik said. "It might just be that having a maggot in the back is uncomfortable." The PLoS ONE study was heavily covered in the media and some unusual outlets. "Our study got picked up on zombie discussion boards, and zombie blogs," Hafernik recalled. "And for the most part the discussion was all very respectful and zombie lovers were interested." The researchers hope to capitalize on the interest in the bees with a citizen science project called ZomBee Watch. The project encourages bee watchers to help map the parasite's spread by uploading photos of possible parasitized bees to a central website.